For other songs called "Darlin'", see Darling. "Darlin'" is a song written in 1970 by English sax player Stewart Oscar Blandamer. There have been many recorded versions of the song, including those by David Rogers as a country song, and in a rock and blues version by Frankie Miller. Further famous versions were recorded by Tom Jones, Barbara Mandrell, Smokie and Johnny Reid. The song was first released by Warrington country band Poacher in 1978. 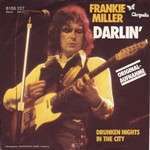 "Drunken Nights in the City"
(1978) "When I'm Away from You"
Miller recorded the song in 1978 and had an international hit with it. It reached number 1 on the Norwegian Singles Chart, and 6 in the UK Singles Chart. "How Long Has It Been"
(1979) "You Are My Rainbow"
A country music version was recorded by the American singer David Rogers. Released on the Republic label, it was never included on an album. Rogers' recording was a relatively minor hit reaching #18 on the Billboard country singles charts. Barbara Mandrell released a cover version in 1979, which served as the B-side to her number one single "Years." In 1980, the song was one of two by Bonnie Raitt included on the soundtrack of the film, Urban Cowboy. It was not released as a single, although her other contribution, Don't It Make You Want to Dance was issued to Country radio. It failed to crack the Top 40 on the chart, peaking at #42. In 1981, Welsh pop singer Tom Jones released the song as a single from his Mercury Records album Darlin'. Jones' rendition also reached the country music Top 20, peaking at #19 there in addition to reaching number 3 on the Bubbling Under Hot 100. The British band Smokie recorded a cover version in their 2000 covers album Uncovered. In 2004, singer Bonnie Tyler released a version of the song on her album Simply Believe. In 2007, Canadian singer Johnny Reid also released a version of the song on the album Kicking Stones. His version peaked at number 57 on the Canadian Hot 100. ↑ Oscar Stewart Blandamer "Stewart wrote his most successful song “Darlin” in 1970, but it wasn’t until 1977 that the song was heard by the management of the British country band “Poacher” (who had won a British tv talent show “New Faces”). It was expected that “Darlin” would be a big hit for them, but despite a great deal of airplay it didn’t happen. However, the single did make the US country charts, which was a rarity for a British act." 1 2 Roberts, David (2006). British Hit Singles & Albums (19th ed.). London: Guinness World Records Limited. p. 366. ISBN 1-904994-10-5. ↑ Whitburn, Joel (2008). Hot Country Songs 1944 to 2008. Record Research, Inc. p. 359. ISBN 0-89820-177-2. ↑ Whitburn, Joel (2008). Hot Country Songs 1944 to 2008. Record Research, Inc. p. 254. ISBN 0-89820-177-2. ↑ "Johnny Reid – Chart history" Canadian Hot 100 for Johnny Reid. "Today I'm Gonna Try and Change the World"